OWENSVILLE, Ohio (March 1, 2016) – The Natural Resources Conservation Service (NRCS) is accepting new applications for a special Environmental Quality Incentives Program (EQIP) for the Five Mile Creek watershed for Ohio farmers who want to improve the natural resources on their land. Applications received by Friday, March 18, will be considered for funding this fiscal year. EQIP is a voluntary conservation program that supports agriculture and environmental quality as compatible goals. Through EQIP, agricultural producers may receive financial and technical help with structural and management conservation practices on agricultural land, such as cover crops, conservation tillage, rotational grazing, winter feeding areas and more. 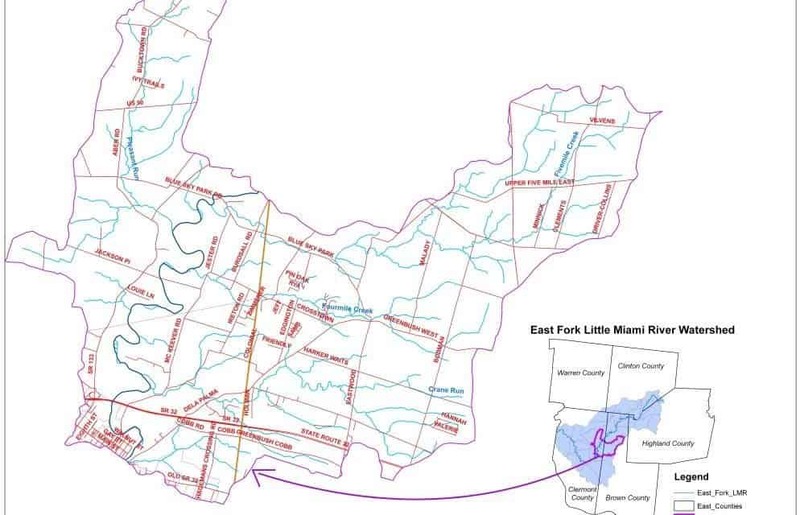 In Brown and Clermont counties, agricultural producers in the Five Mile Creek watershed interested in applying for EQIP and conservation planning assistance should contact Lenhart prior to March 18 at 513-732-2181, ext. 102, or by email at lori.lenhart@oh.usda.gov. If you are unsure as to whether your farm is in the watershed, contact Lori or check the map (above).